Advanced Packaging Tool (apt) and aptitude are not synonymous. Erroneously many thinks apt is abbreviation of aptitude. In other words apt-get install is not the shortcut of the command aptitude-get install. Also notice the notation style – APT is the abbreviation of the phrase Advanced Packaging Tool, as we use as command, it often used in all small letters. But, aptitude is itself of all small letters. What is Advanced Packaging Tool (apt) and What is aptitude? Advanced Packaging Tool (apt) is a package management system, it was developed for Debian GNU / Linux is developed and dpkg is the actual package management which is used. The aim is to easily search, install and update the software packages. APT consists of a program library and this library multiple-use command-line programs, of which apt-get and apt-cache are the keys. 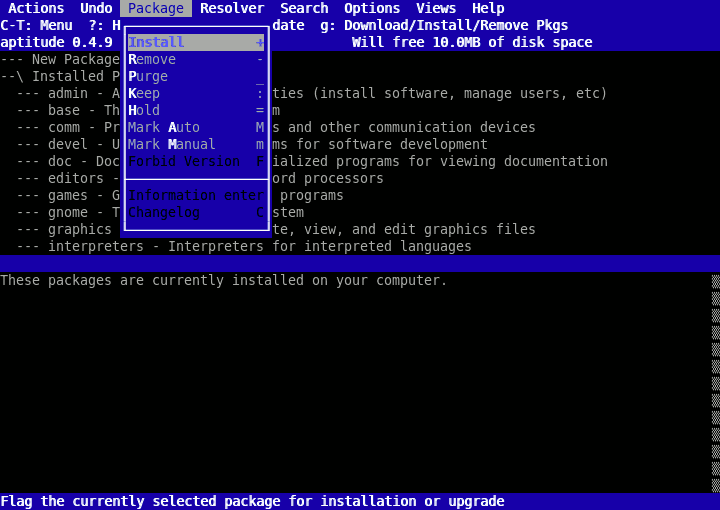 Since Debian 3.1 is the use of APT as a console-based package management system is recommended. Advanced Packaging Tool (apt) is also available in OpenSolaris, was also can be used on OS X. Based on the idea of APT-Get a Windows version was created, which has a similar package manager for MS Windows. aptitude, on the other hand is a computer software; which is the frontend for the Advanced Packaging Tool (APT) package management system. It displays a list of software packages and allows the user to interactively manage packages. It was originally for the Debian GNU / Linux distribution created but also appears in RPM -based distributions. This is why there is way to convert .deb package on .rpm Based Linux. In the /etc/apt/sources.list file, there are the so-called repositories mentioned, i.e. they indicates the sources for the packages. This can either CDs or DVDs, directories on the hard drive or more often; directories on HTTP or FTP servers. The requested packet is located on a server (or a local disk), it will be automatically downloaded and installed. APT is concerned primarily with the procurement packages, the comparison of the available versions of the packages and the management of package archives. Actually we can browse these repositories (on FTP or HTTP) via browser. aptitude uses ncurses library, it provides a character based user interface. It has a command line interface. aptitude has an additional layer stored in the packet states (package states). There, the registered software packages and dependencies are written. Furthermore, aptitude maintains a full log of the entire installation history and dependencies. There is no single “apt” program; apt is a collection of tools. A significant part of apt is a C++ library of function. /etc/apt/sources.list # Locations to fetch packages from. /etc/apt/sources.list.d/ # Additional source list fragments. /etc/apt/apt.conf # APT configuration file. /etc/apt/apt.conf.d/ # APT configuration file fragments. /etc/apt/preferences # version preferences file. /var/cache/apt/archives/# storage area for retrieved package files. /var/cache/apt/archives/partial/ # storage area for package files in transit. /var/lib/apt/lists/ # storage area for state information for each package resource specified in sources.list /var/lib/apt/lists/partial/ # storage area for state information in transit. /etc/apt/sources.list # Locations to fetch packages from. /etc/apt/sources.list.d/ # Additional source list fragments. /etc/apt/apt.conf # APT configuration file. /etc/apt/apt.conf.d/ # APT configuration file fragments. /etc/apt/preferences # version preferences file. /var/cache/apt/archives/# storage area for retrieved package files. /var/cache/apt/archives/partial/ # storage area for package files in transit. /var/lib/apt/lists/partial/ # storage area for state information in transit. This Article Has Been Shared 3572 Times! Cite this article as: Abhishek Ghosh, "What is Advanced Packaging Tool (apt) and aptitude," in The Customize Windows, March 12, 2014, April 20, 2019, https://thecustomizewindows.com/2014/03/what-is-advanced-packaging-tool-apt-aptitude/.